What is the scope for blockchain technologies? “There is technology becoming available … I don’t claim to be an expert on it but the most obvious technology is blockchain” boasted Chancellor Philip Hammond at the Conservative Party Conference, when discussing the Irish border challenges of Brexit. What problems can blockchain tackle? Now, I also do not claim to be an expert in blockchain technology, but from what I understand, I did not think blockchain technology was going to help solve the Brexit Irish border issue. Nevertheless, what this revealed to me was that I was poorly informed as to what blockchain technology truly represented beyond the hype of cryptocurrency, and what problems blockchain technology was reasonably equipped to tackle. Certainly, within healthcare, reports often appear stating that medical records or genetic test results will be “put on the blockchain”, but what this actually represents remained rather opaque to me. To up-skill myself — and help determine whether the hype associated with blockchain technology is justified — I enrolled on Coursera’s blockchain foundations course, created by ConsenSys Academy. Having recently completed the course, I certainly feel better informed regarding blockchain technology and can now sensibly engage in discussion regarding its implementation, beyond the superficial knowledge I have regarding Bitcoin and Ethereum. The course does a good job at outlining the basic concepts of what a blockchain is, how and why it was created, provides an overview of the technical components underpinning the technology and, most importantly for me, provides a framework to establish whether or not a blockchain technology should be considered as a possible solution, for a given challenge. 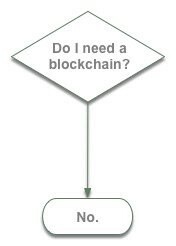 The first thing to appreciate is that a blockchain is only useful when a database is required. Furthermore, blockchains really only have an advantage over traditional databases when multiple users require “write” access to that database, and those users are either unknown, untrusted or in possession of conflicting interests. Even then, databases can accommodate these scenarios, typically through a trusted 3rd party. But when such an entity cannot be relied upon, a blockchain solution might be a possible option. If a blockchain solution is required, there are a range of additional considerations that need to be addressed to determine whether a public or private blockchain is most suitable. Jeremy Millar, Chief of Staff at ConsenSys, has outlined an approach for this here. Whilst the content of the course might not stimulate blockchain aficionados, it provided the necessary foundations to appreciate how blockchain technology can be applied and what limitations are currently present.